I spent two weeks in Cuba at the beginning of a long 6 month trip and wish I hard read any kind of Cuba packing list before I travelled the Caribbean island. When arriving in Cuba I realised I had made a monumental packing list error, when I realised I didn’t have enough sun cream. If you’re travelling to Cuba for 2 weeks or longer then you’ll want to study this packing list to ensure you know what to do when packing for your trip to Cuba. Equally, if you are planning to see Cuba on a budget you’ll want to check out this Cuba packing list to save your budget for all the amazing activities and things to do in Cuba. Budget travel and backpacking in Cuba is becoming more and more popular as the country becomes more readily available to international tourists. If you are heading to Cuba, there are some do’s and don’ts for your packing list you’ll want to take note of before leaving your home country. Some simple items such as toiletries and basic medication are impossible to get in Cuba due to its political and economic system. So, if you are backpacking Cuba solo or travelling Cuba on a budget you’ll want to be prepared. By following this packing list you won’t have to face any of the difficulties travelling in a closed economy may bring you and unlike us, you won’t need to dedicate an entire day to the great sun cream hunt. 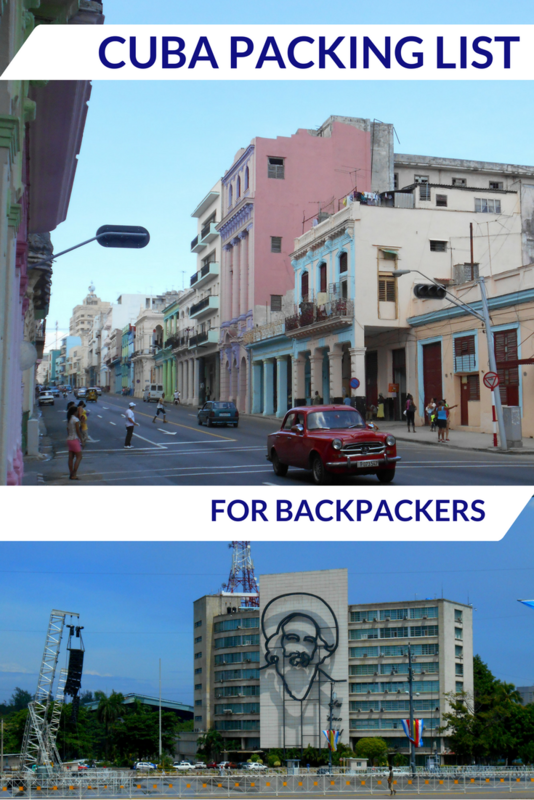 Make sure you pack the right items for your time backpacking Cuba and avoid making the same mistakes as we did. If you have to sacrifice other essentials then do so but not the sun cream. Make sure you have enough sun cream to last your full trip, the sun is hotter than hell especially by the ocean and in popular tourists resorts like Trinidad so make sure sun cream is at the absolute top of your Cuba packing list. When we realised we didn’t have enough sun cream for our two weeks in Cuba we had to go shopping and what was available to us was not your typical kind of SPF sun cream. It looked more like sun block or toothpaste when applied to the skin. Similar to sun cream after sun cream can not be purchased in Cuba and we didn’t see this item once in any shops during our time in Cuba. The sun is hot in Cuba all year round and nothing really beats that refreshing feeling of having after sun moisture on your frazzled skin. This is also an essential for staying safe in the sun. It may sound like an odd one but having a small box of water purification tablets with us saved us so many times whilst travelling in Cuba. Water is widely available in Cuba of course and water can be purchased in large bottles for around $2. But the tap water in Cuba is not for drinking like many couturiers in Latin America and the Caribbean. Smaller towns often have fewer, badly stocked shops which close down on weekend. Add this extra precaution to your Cuba packing list. As crazy as it sounds sanitary products are not widely available in Cuba and when they are they are very expensive. Bare this in mind if you are a female traveller doing Cuba on a budget. Stock up on everything you’ll need before hand. The same rule goes for condoms and contraception. Toothpaste and other essential toiletry items are hard to find in Cuba, although for the most part you can always grab a bar of soap. Toiletries aren’t always the cheapest or easiest to come by in Havana or other areas of Cuba. It’s unlikely you’ll ever have access to branded or regulated products either which can be an issue. Take what you need with you for a backpacking trip to save on high costs mainly. Sun cream as mentioned previously is an essential item to add to your Cuba packing list. Imodium, paracetamol, antihistamine all fall under this category for your Cuba packing list and what to pack for Cuba. Take with you any pharmaceuticals you’ll need during your stay on the island. of Cuba. Prescription medication goes without saying but other essentials are hard to come buy. Plus you may need the painkillers for all the Mojito induced hangovers you’ll experience. Mosquito/insect repellent and after-bite should make your packing list for Cuba. Although there’s no malaria in Cuba there are still mosquitoes, hungry ones! Stock up on sprays and creams before you arrive and always make sure you check customs rules for DEET percentages. DEET is the chemical in most insect repellents that mosquito’s hate, but it is banned in many country and only certain percentages are allowed in others. You can check the DEET percentage on the back of the bottle. I always recommend when travelling long-term to take with you a mini first aid kit with all the essentials for any trip long backpacking trip. This is the same for Cuba and any other country in the America’s. Plasters, bandages and antiseptic wipes are items that are not easy to find in Cuba. They can also be pretty expensive when they can be found. We didn’t see one single place selling travel adapters in Cuba. Make sure you take the correct adapters with you for your stay especially backpackers who won’t be staying in a resort that may offer adapters to guests. This is an unmissable packing list item if you are backpacking Cuba solo. In Cuba the standard North America travel adapter is the one you’ll need. Other non essential items for a backpacking trip to Cuba include a mosquito net, flashlight, travel locks, money belts and a hat for that killer sun I’ve refereed too several times. Its always wise to have a travel lock with you when travelling long-term or as a solo traveller. Although we found Cuba to be exceptionally safe with minimal crime it is still important you can protect your valuables as a standard travel rule. Money belts and travel wallets are also advised as it’s a great and safe way of keeping your cash, passport and valuables hidden. When travelling you often decide to keep you valuables on your person at all times. We learnt that most rooms in Cuba do not have safes, so it’s always nice to know your money is safe. Packing lists aren’t always essential. But for a country like Cuba where toiletries and commodities aren’t always available and accessible having some pre-trip backing insights can be really handy. Especially if you are on a strict budget and don’t want to end up spending over the odds on everyday essential items. If you plan on seeing Cuba on a budget then you’ll want to ensure you pack all these essentials, to avoid the pain of having to find them during your stay. If you’re going to Cuba it’s probably best you figure out how to avoid the daily hustle in Havana. 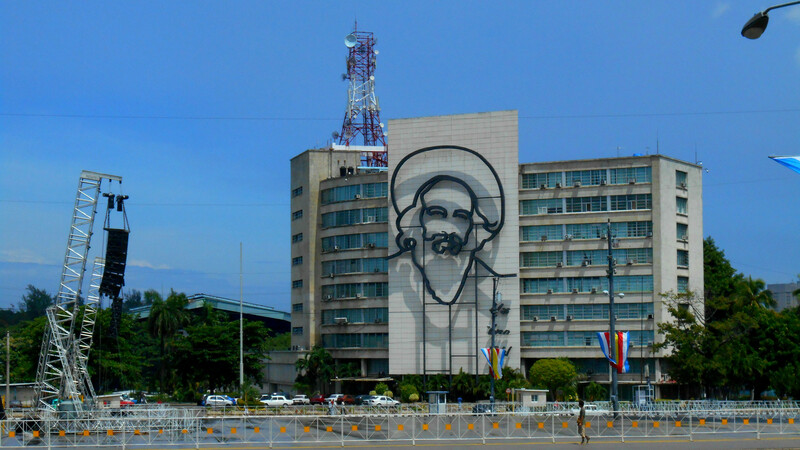 Cuba is an incredible and diverse island with so much history and unavoidable culture. But, Cuba also has it’s problems and the daily hustle and begging a prevalent throughout the capital and larger cities. It’s not uncommon that you’ll witness this as the general thought of tourists in Cuba is wealth. Many locals aim to be as close to tourists as possible because of this conceived wealth. The hustle can make seeing Cuba on a budget difficult at times, but despite the struggle Cuba is the type of magnetic fun country that everyone should aim to see in their lifetime. The below budget is based on two people sharing per day in Cuba. Bringing the total daily budget for two people at $60 – $70 per day. Accommodation will cost you $20 per night for two people in a Casa Particular. These are locals homes tourists stay in and the only real way to truly travel Cuba authentically. Eating can be done very cheaply. If you stick to street food and small snacks, I’d suggest sticking to $10 – $15 per day for street food and $10 for an evening meal at a restaurant. Drinking in Cuba is also pretty cheap. Local beers are on offer for $2 along with a classic Cuban Mojito which is also roughly around $2 – $4. Taxis and transport are one of the more costly things in Cuba. You can easily spend $20 per day on taxis back and forth. Taxi drives tend to always round up the price to $10 no matter what the distance. Long distance travel can also be pretty expensive given the size of the country. Tourists are very rarely able to travel on local bus services and end up using the Viazul. The Viazul is an exclusive tourist only bus service. Tickets to Trinidad and other areas can cost between $20 – $50.